Description: A flagpole and monument honor all veterans. The inscription on the monument reads: "Veterans Memorial ~ Sponsored By American Legion Post 258 ~ Donated By Grateful Community Citizens". Above the inscription (on both sides of the monument) are the names of local veterans. Description: Granite statue with Soldier at Rest. 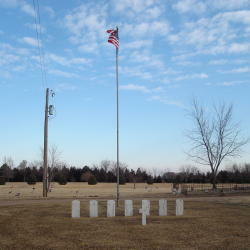 Inscriptions on the Base of the Stature read: "In Memory Of The Defenders Of Our Union 1861 - 1865 ~ Lest We Forget ~ Erected By Rice County 1918". The statue was erected in 1918 at a cost of $10,000. 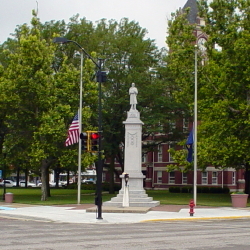 The plaza surrounding the statue has two flagpoles and an eternal flame. Description: Monument has an American Eagle and symbols for each branch of the service engraved above the inscription: "In Honored Memory ~ Of Those Who Gave ~ Their Lives For ~ Our Freedom". In front of the monument are 6 bronze medallions including (from left to right): G.A.R., Spanish War Veterans, US World War, WWII, Korea, and Vietnam. Just beyond the medallions is another marker inscribed: "Unknown Soldier ~ To You From Failing Hands ~ We Throw The Torch ~ Be Yours To Hold It High". Description: A concrete pedestal is in front of the Sterling Library. A rifle and saber are fastened into the front. 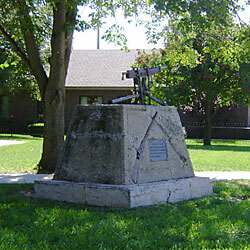 A bronze plaque reads: "This gun is to mark ~ those two trees planted ~ by the W.R.C. 237 in memory ~ of Mead Post No 14 G.A.R. ~ Dept. of Kansas". 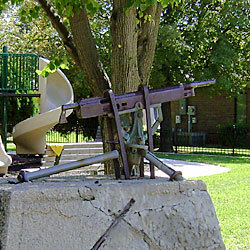 Mounted on top is a more recent vintage machine gun. 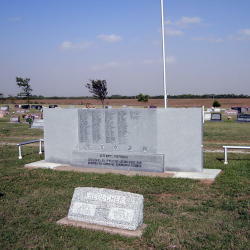 Description: Seven granite markers are erected in front of a flagpole. The markers are engraved: "Civil War ~ 1861 - 1865", "Spanish War ~ 1898 - 1902", "World War ~ 1917 - 1918", "World War II ~ 1941 - 1945", Korean War ~ 1950 - 1953", Vietnam ~ 1964 - 1973", "Persian Gulf ~ 1990 - 1991". 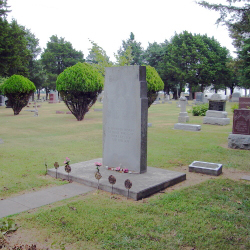 The cross in front is inscribed "Unknown".